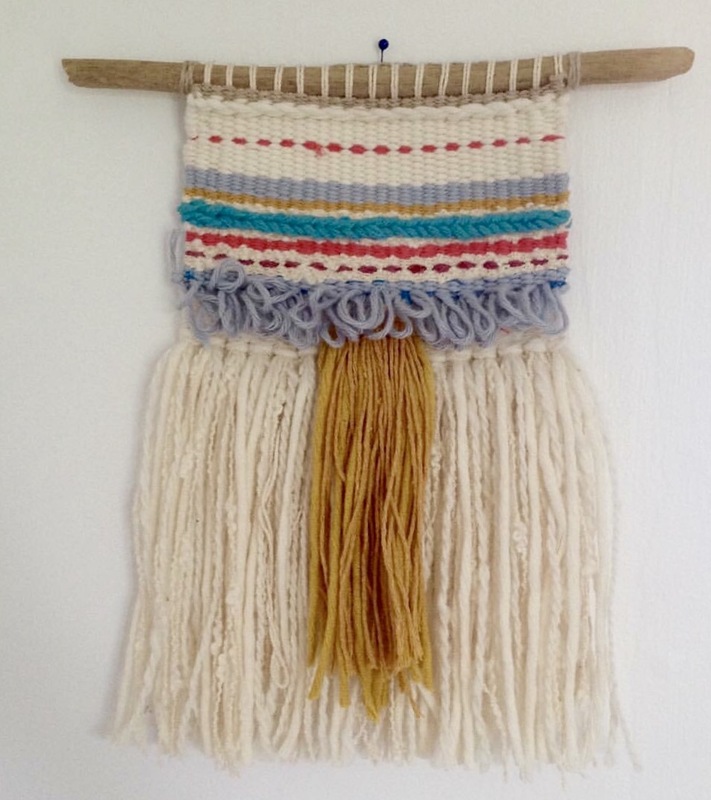 Weave your own contemporary wall piece – One day workshop Saturday Sept 1st plus other dates to come. For this session, there will be a selection of table and floor looms for you to use. These will be ‘dressed’ and ready to go with the vertical warp threads all set up – so you don’t have to do the tricky and labour-intensive preparation. Following a hands-on demonstration, you can start to weave your very own fabric sampler. During the workshop you will explore different fabric structures and weaving techniques. There will be a wide variety of colours and materials to choose from (including luxury New Zealand & hand dyed yarns). 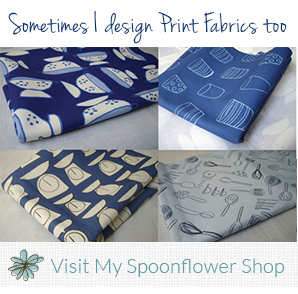 You will take home a small piece of fabric approx 20cm wide by 20-40 cm long. All materials are included in the course fees but you are most welcome to bring in any special yarns you wish to incorporate into your piece. For inspiration, you can also bring some images of your favourite objects, postcards, magazine cut-outs etc. These will help you choose colours and textures for your piece. Or you can choose from a folder of inspiration images in the studio. For further information and bookings, please visit the NZ Textile Experiences website. 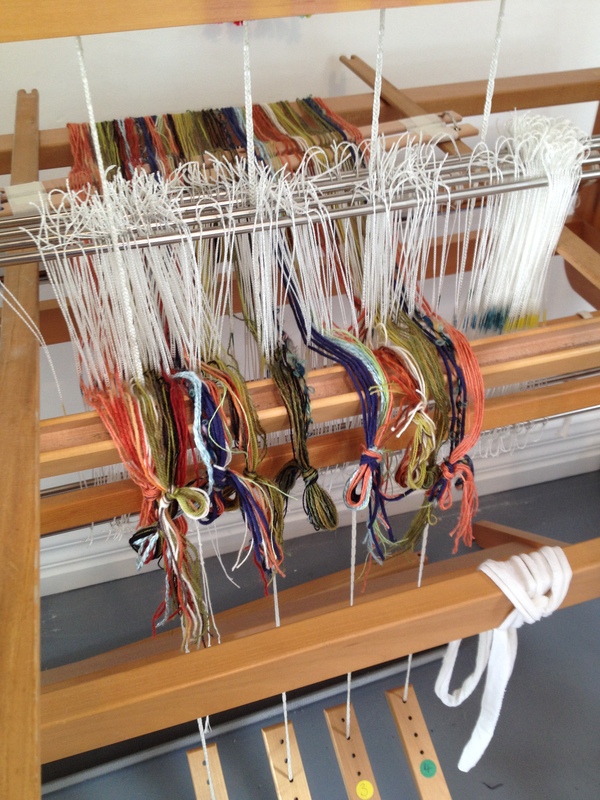 I’ll be hosting a couple of one day workshops in October called ‘Small Loom Weaving’. We will be using luxury New Zealand fibres and local colour inspiration to make some lovely hand-woven decorative pieces. Please head over to the NZ Textile Experiences website to find out more about all the unique and exciting workshops available and to book a place. When? Every Wednesday for 6 weeks from 27th July to 31st August from 9.30-12.30. Where? 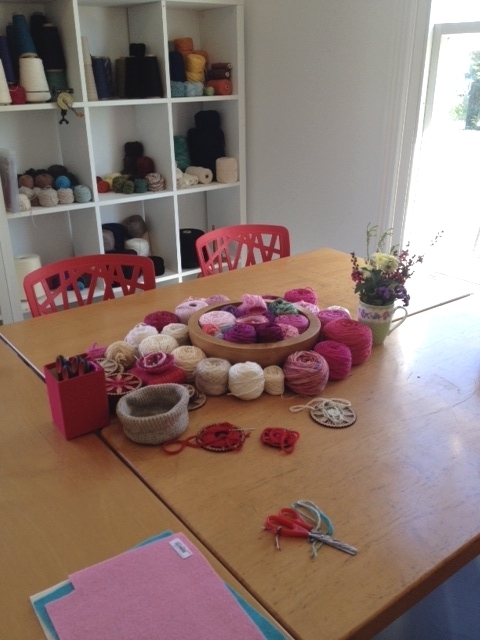 Classes will be held in The Railway Cottage Studio, Founder’s Park, Nelson. Who? 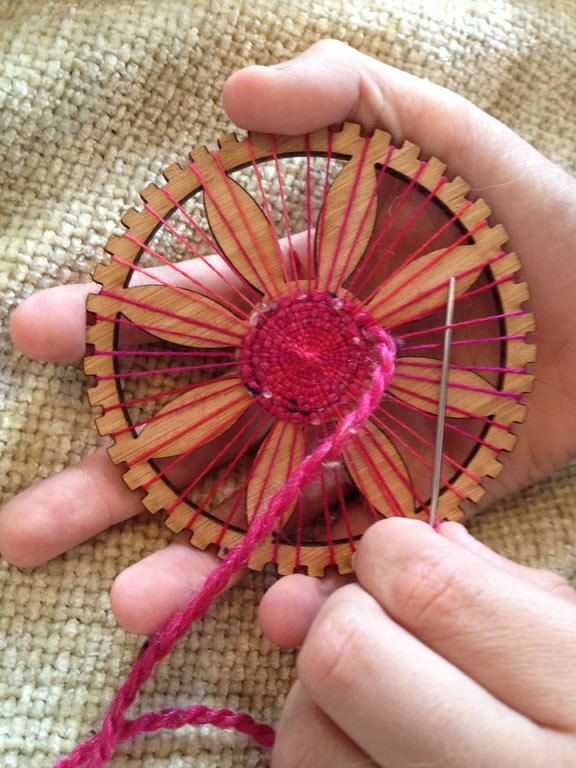 Small groups of 3-6 students who are at beginner or intermediate level (or those need a refresher to get weaving again) The small class is taught by experienced textile designer Karuna of Twill Textile Design in a lovely studio setting at Founders Park. Bookings: Please book directly to secure your place. Unfortunately, this class may not run if there are less than 3 students. By covering basic theory, we will be consolidating some of the weaving practices you have experienced so far. This should help you understand not just how you set up a loom and weave a fabric, but why you set it up in a certain way and how you can change elements at each stage of the process to achieve different results. Fabric and yarn properties, yarn sett and reed formulae, wpi, epi and ppi, yarn calculations, interpreting projects found in books and magazines (inc. converting tie-ups for different looms), weave notation, understanding the ‘drawdown’, formulating your own threading drafts on paper, warp & weft design, weave structures…..
A variety of materials is available to choose from at the studio and is included in the course fees. Tea/coffee is served, but feel free to bring along your favourite takeaway drink/snack if you wish. An A4 ring binder folder with some A4 plastic insert sheets, A4 paper for taking notes, pencil, pen, eraser, ruler (with inches on it), calculator. What? Design and weave your own striped scarf – from start to finish – using your favourite colours. When? Term 2 2016. Every Wednesday for 6 weeks from 4th May to 8th June from 9.30-12.30.
Who? 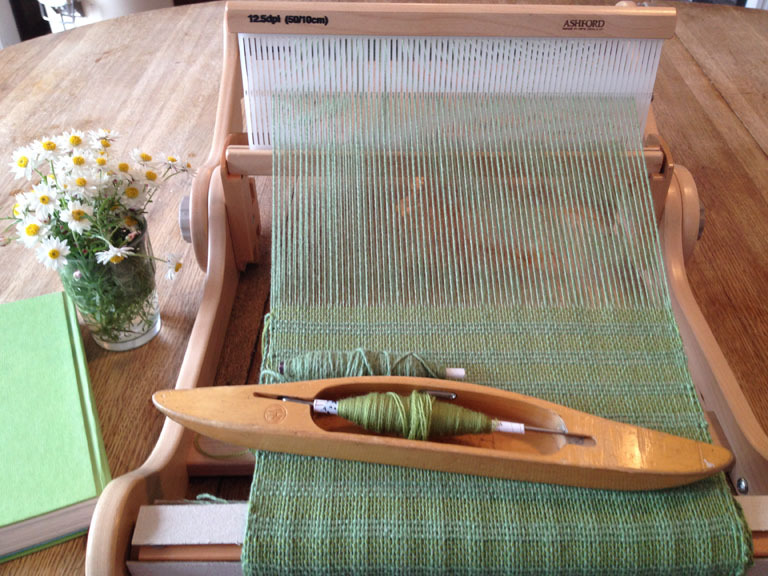 Small groups of 3-5 students who are at beginner or intermediate level (or those need a refresher to get weaving again) The small class is taught by experienced textile designer Karuna of Twill Textile Design in a lovely studio setting at Founders Park. Bookings: Please book directly with K to secure your place. Unfortunately, this class may not run if there are less than 3 students. In term 2 of 2016, the first focus will be on how you can design a striped warp using suitable yarns and interesting colour combinations. 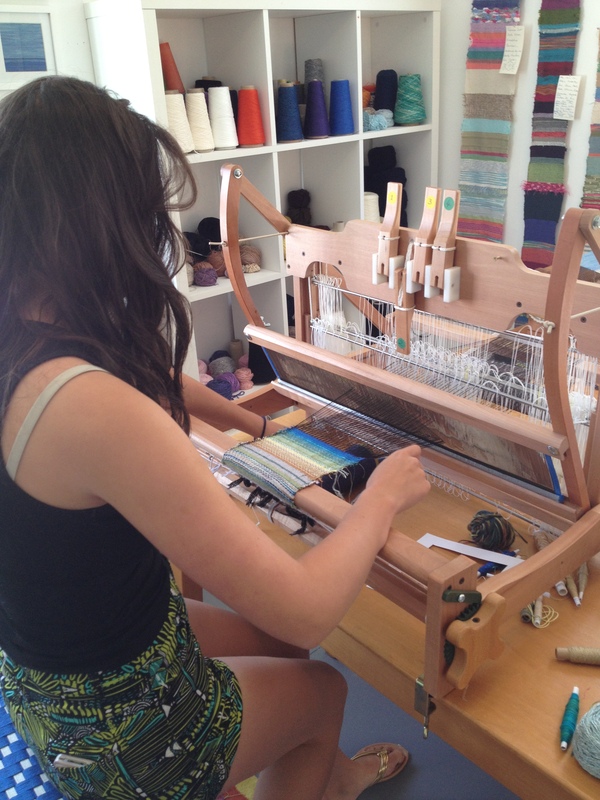 We will then learn to set up a loom (either rigid heddle or 4-shaft table loom) using the direct warping method. During this course you will also learn about combining colours, hem stitching, making tassels, and how to ‘finish’ you scarf once it comes off the loom. A variety of materials is available to choose from at the studio and is included in the course fees. You are most welcome to source your own yarn from other suppliers or from your own ‘stash’ but please note, this will be at your own additional cost. Tea/coffee is available at the studio but feel free to bring along your favourite takeaway drink/snack if you wish. When? Term 1 2016. Every Wednesday for 6 weeks from 10th Feb to 16th March from 9.30-12.30. If there is lots of interest, another class will also run alongside either on a Thursday morning or Saturday afternoon (to be advised but please state your preference). Who? Small groups of 4-6 students who are at beginner/intermediate level or those need a refresher to get weaving again. The small class is taught by experienced textile designer Karuna of Twill Textile Design in a lovely studio setting at Founders Park. Bookings: Please book directly with Karuna to secure your place. Unfortunately, this class will not run if there are less than 4 students. In term 1 of 2016, the focus will be on how you can weave a variety of pattern and texture by setting up the looms in different ways. There will be six looms ready to go when you arrive. Each student will spend a week exploring a particular weave structure, before rotating onto another loom the next week and so on. At the end of the six weeks, you will have a collection of fabric samples as well as technical notes describing how each fabric is made. We will also have plenty of class time for discussion on the possibilities of each type of loom set-up. The techniques you explore this term will lead into the next term’s project if you wish to continue. 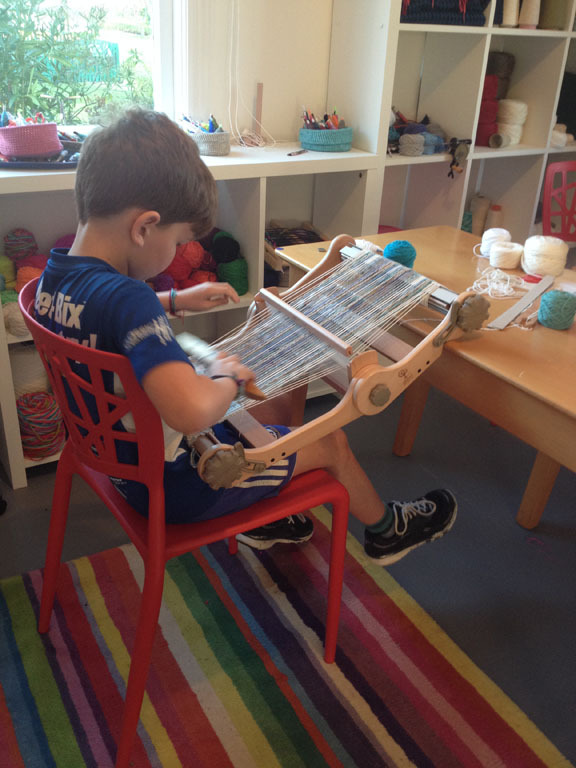 Term 2 will involve designing and setting up your own loom for a personal project which further explores one of the drafts you have enjoyed in term 1. I’m so look forward to it! New and continuing students started this 8 week course on Wednesday 22nd April. There are now 6 students enrolled so my little studio is at full capacity for this session. If you are interested in coming along, just get in touch. If I have enough applications, I’ll be more than happy to set up another class/session. If you are not sure about committing to an 8 week course, you can arrange a two hour taster session – why not bring a friend or two and make it a get-together? 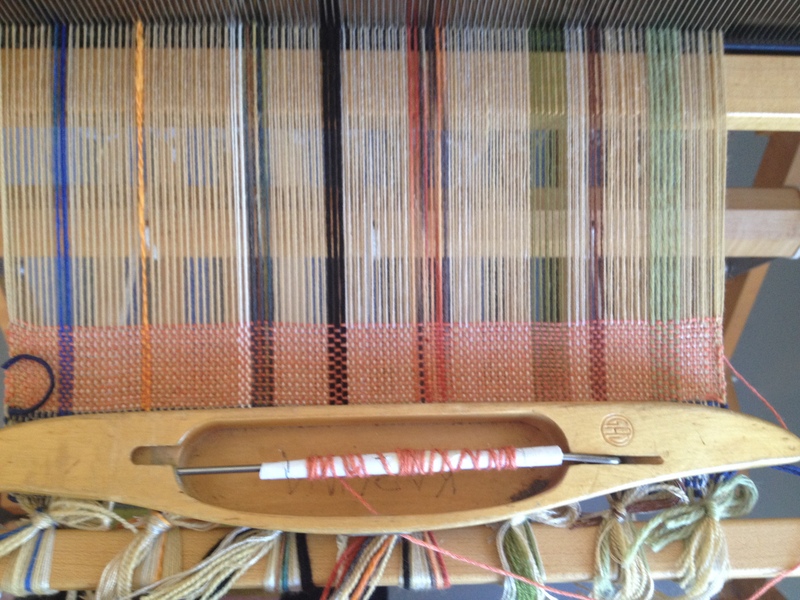 A beginners learn to weave course will be starting on the 11th Feb 2015. The course will run every Wednesday morning 10am-12noon for eight weeks. 10am-12noon on Wed 7th, Friday 9th, Monday 19th and Wed 21st January. Scroll down to the bottom of this page to make an enquiry. They are suitable for creative boys and girls who are (approximately) 7 to 14 years old. Your teacher will be textile designer and resident weaver Karuna. Small groups of 4-5 children so please book your place. Parents are welcome to stay – grab a takeaway coffee and read a magazine on the couch or join in, help,have a go. Alternatively, go for a little wander around the park if your child is happy to stay. 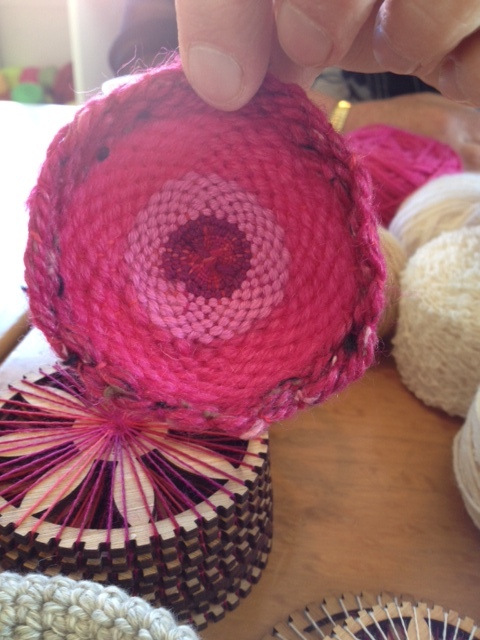 PS: Adult workshops and weaving classes will start next term. Please contact Karuna to register your interest. Please register your interest using the form below. 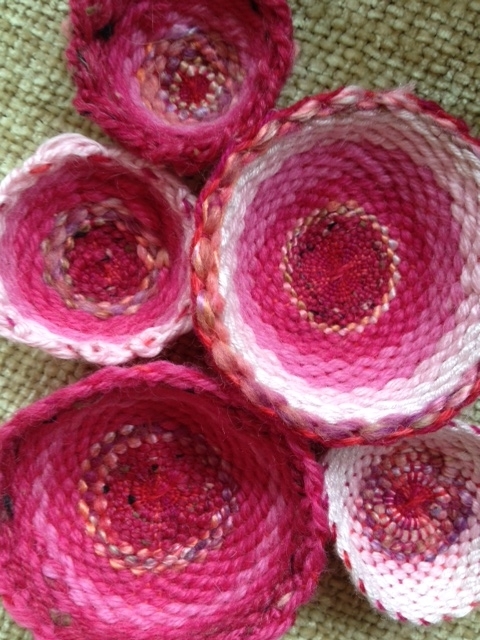 To celebrate the arrival of Spring, we held a little Circle Weaving Workshop on Saturday 21st Sept. 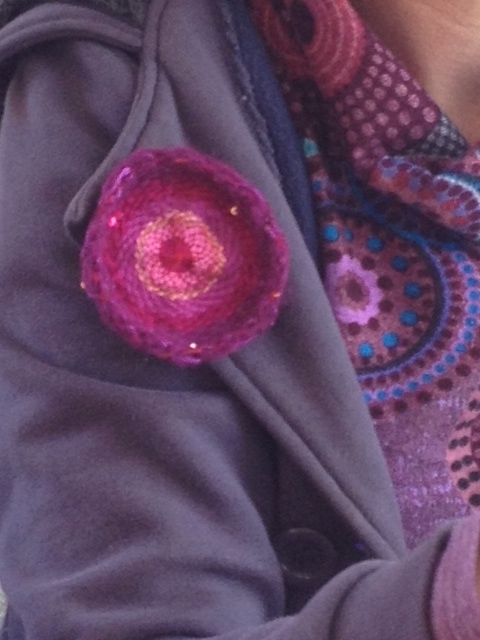 The Japanese Blossom festival was on in Miyazu Park too, and it was a beautiful sunny day, so we made flower brooches. Lots of visitors joined us for an hour or two and made some beautiful cherry blossom inspired brooches. Thank you to everyone who came along. 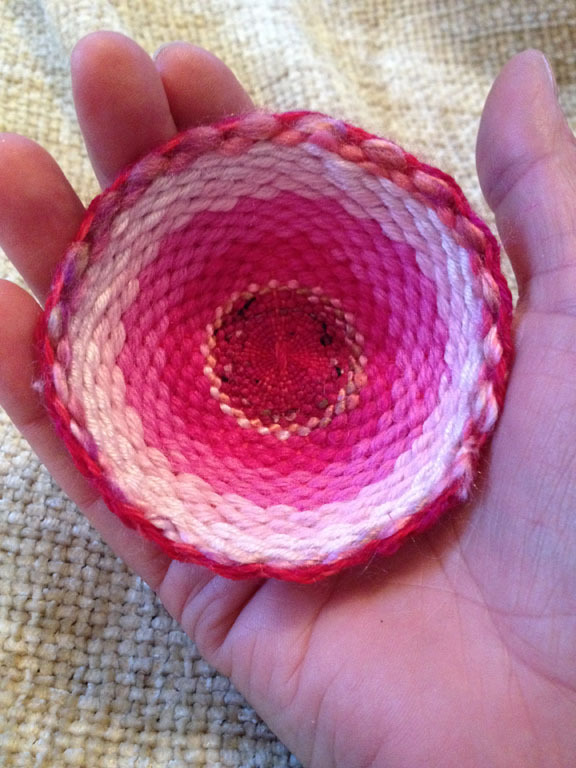 If you are interested in having a go at circle weaving, just contact me and I will set up another date soon. If you have a little group of friends who would like to get together and learn to circle-weave, I am more than happy to have you over to the studio or if you are in Nelson and surrounds, I can come to you. 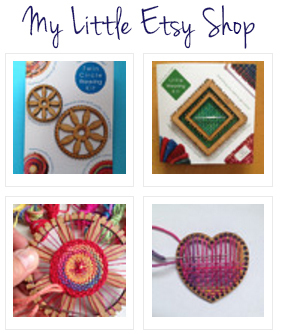 I also have little circle frame looms for sale at the studio if you want to have a go at home. Circle joy. Woven, printed and embroidered textile art. Made by hand with aroha. A special collaboration between Twill Textile Design and Nester Prints. Exciting new collaboration and exhibition with Nester Prints and Pango & Ma. Head along to Morri st cafe for coffee, yum food and new artworks on display.